We weren’t underwater long before the men in grey suits showed up. Reef sharks, six feet long, with muscles that rippled under the skin, swam in formation like a squadron of fighter jets. Our small group of divers was drifting on a two-knot current on a site fittingly called the “Fish Bowl”, offshore of St. Maarten, surrounded by a labyrinth of hard corals and a menagerie of colourful fish. But the macro photos of nudibranchs and cleaner shrimp were forgotten when the sharks appeared. The magnificent creatures swam effortlessly against the current, their sleek forms following function in pure Bauhaus beauty. On my wrist was another Bauhaus case study, the Nomos Ahoi Atlantik, a watch so cleanly designed, it appeared almost out of place amidst the jumble of high-tech diving gear. In fact, minutes before splashing into the Caribbean, a fellow diver spied it on my wrist and asked whether it was capable of going deep. “Looks ornamental,” he exclaimed. I assured him it would be fine before biting my regulator and back rolling into the sea. Contrary to what some will have you believe, a dive watch is not suitable for all occasions. Sure, a certain secret agent has been known to wear one with a dinner jacket, much to the chagrin of style pundits everywhere. But there’s a time and a place for a dive watch and that is fifty fathoms underwater with a tank on your back or some other similarly sporting activity. That said, more refined watches have their limitations also, such as when you want to take one watch on a holiday that you can wear from the beach to the dining room. Nomos Glashütte has solved this dilemma with the Ahoi Atlantik. Nomos has become something of a symbol of the rebirth of the German watch industry. Headquartered in the East German watchmaking mecca of Glashütte, Nomos was founded the year after the Berlin Wall came down and hasn’t looked back since. The appeal of this “little brand that could” is a blend of razor-sharp styling with bona fide in-house movement manufacturing. Until recently, Nomos watches have been decidedly terrestrial, built more for architects in frameless spectacles and black turtleneck sweaters than vacationers in board shorts. But when Nomos debuted the Ahoi, its first legitimate sports watch, that architect suddenly had a watch to wear when he swaps his turtleneck for swim trunks. As Caribbean islands go, St Maarten isn’t usually at the top of the list for scuba diving. The half-Dutch, half-French island is a popular stopover for bare boat sailors and beach lovers who come for the diverse blend of cultures, languages and the lush mountainous terrain. It is also a popular anchorage for maxi-yachts that moor up offshore, saving the five-figure marina fees on nearby St Barth’s. But with numerous wrecks, a shallow reef and a heathy ecosystem, St Maarten is as enticing underwater as it is topside. We found a small dive shop run by a chain-smoking Dutch expatriate who agreed to take us out for a few days to explore the sites that ring the southern coast. The discarded rubble of the old Simpson’s Bay drawbridge has become a man-made reef teeming with eels and lobsters that hide among the concrete, as jetskis and powerboats roar just meters above. Further out, the upright wreck of a scuttled cargo ship hosts an armada of steely barracuda that hang motionless above the deck, their watchful eyes following each diver’s every move. But on our second day out, the old Dutchman said, “if you want to see sharks, we need to go to Fish Bowl,” and angled the boat to the southern end of the island. 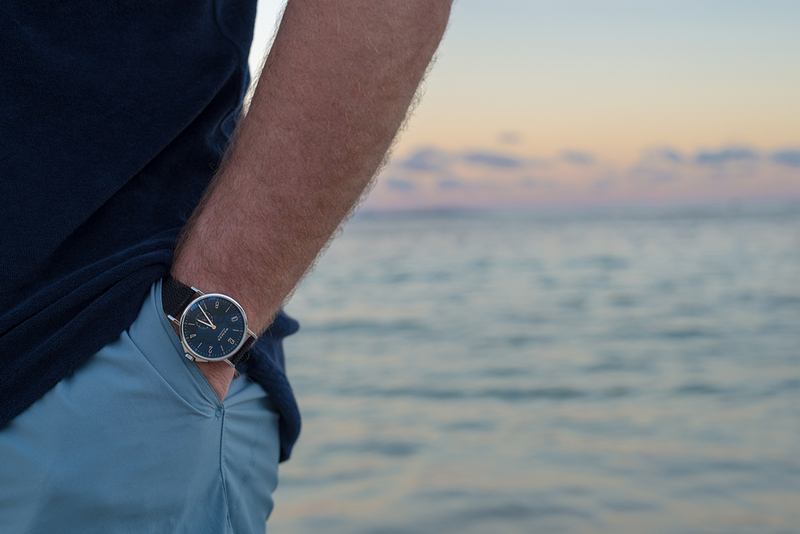 The Ahoi solves the “one watch” conundrum not by dressing up a dive watch but by toughening up a dress watch. It is based on the Tangente, one of Nomos’s most popular models. With a thin bezel, minimalist dial and thin angular lugs, the Tangente has perhaps defined Nomos style best over the years. This is pure form following function in the tradition of the Bauhaus philosophy that has become synonymous with Teutonic design since its heyday in the 1920s. Thin stick hands, slender yet legible numerals and a lot of open space make up the dial and the case is similarly spare. Really the only addition that hints at the Ahoi’s more robust design brief is the set of shoulders that surround the crown, to protect it from inadvertent blows; even this addition is subtle and ingenious, done with a single piece of steel. 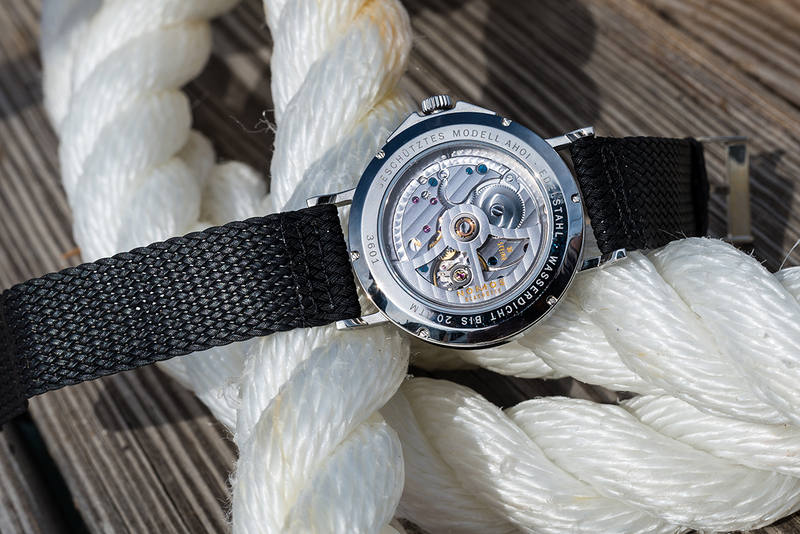 Aside from the crown guards, the other trait that makes the Ahoi a capable sports watch is its 200-meter water resistance, a depth rating suitable for diving. There are two versions of the Ahoi. The original, released in 2013, has a white dial with light blue hands and a red small seconds hand. The following year, Nomos debuted the Ahoi Atlantik, whose dial color was chosen, according to its designer, to conjure the Atlantic Ocean on a stormy day, “somewhere between dark blue and black”. It was decidedly not Caribbean blue yet it looked right at home in St Maarten, though perhaps more on land than underwater. Beside its playful colorways, the Ahoi’s strap is equally holiday-friendly. Made from a woven textile often called Perlon, it doesn’t absorb water, dries quickly once back topside and the lack of holes means its adjustability can be fine-tuned to fit heat swollen wrists, simply by poking the buckle pin through. Nomos says the strap was inspired by the looped fobs provided with locker keys at swimming pools and indeed the aesthetic is more pool deck than a chunky rubber dive strap would be. But the ability to fine tune its length makes the strap equally well suited for wear over a wetsuit sleeve. Being at the top of the food chain, sharks are a bellwether of an ecosystem’s health and vital to maintaining it. They are also a star attraction for divers. St Maarten recognised this and designated the waters around the entire Dutch coastline a marine park, prohibiting fishing, a move that makes the island one of the Caribbean’s best kept dive destination secrets. The Fish Bowl sits out of the lee of the island and thus the currents here are stronger, necessitating “drift” diving, allowing the current to pull you along as if on an underwater conveyor belt while the dive boat follows on the surface to pick you up at the end of your time underwater. Swimming against the current is futile, requiring great effort that would drain an air tank in minutes. But drift diving also requires great trust in your boat captain, since in order to follow, he must follow your bubbles on the surface, not always an easy task, especially in choppy seas. 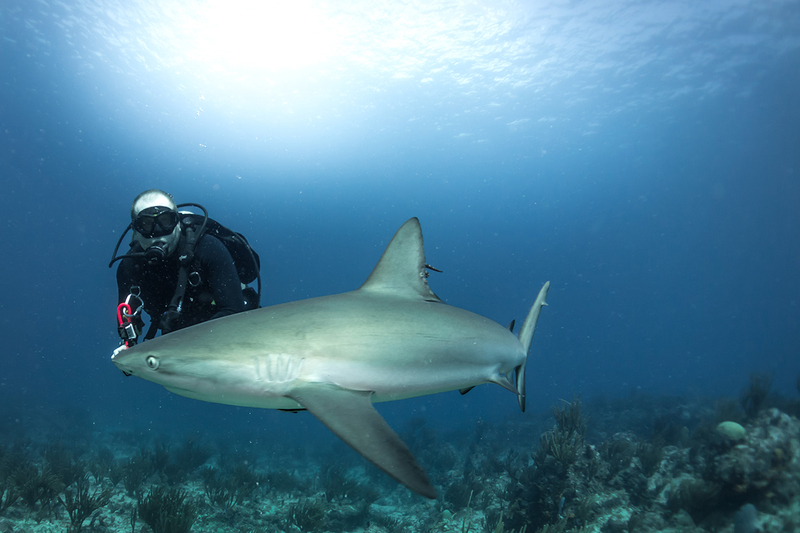 There are two kinds of sharks that frequent St Maarten’s waters – Caribbean reef sharks and nurse sharks. The latter are more docile, often spotted napping under ledges, while the reef sharks are constantly moving, prowling for prey. The spearfishing of invasive species by divers means that sharks have come to associate people with an easy meal. Sure enough, the mere sound of our noisy scuba regulators brought the sharks of both kinds. They followed us at a respectful distance for a while but soon got bolder and would dart in between two divers or shadow one a few feet away. We weren’t on the menu – a six-foot long diver wearing a tank and making a lot of noise would be far too risky a prey to pursue – but the sight of that familiar shape swimming towards you does provoke a primal reaction. I tucked my wrist, with the polished, reflective steel Ahoi on it, close to my body just to be safe. 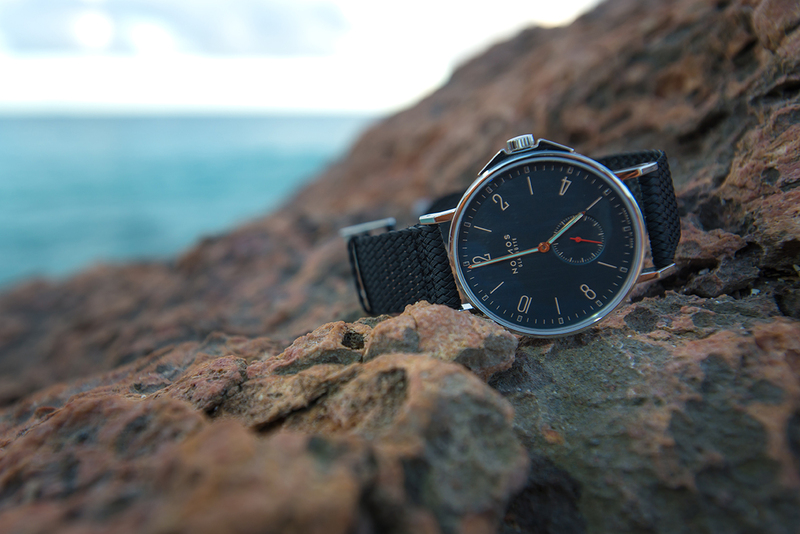 Make no mistake, the Nomos Ahoi is not a dive watch. To be called that would require a way to track elapsed time, such as a rotating bezel. So while its ability to withstand 20 atmospheres of water pressure means it can go subaquatic, a diver can’t rely on it as a backup bottom timer unless he sets the minute hand to 12:00 before splashing in. 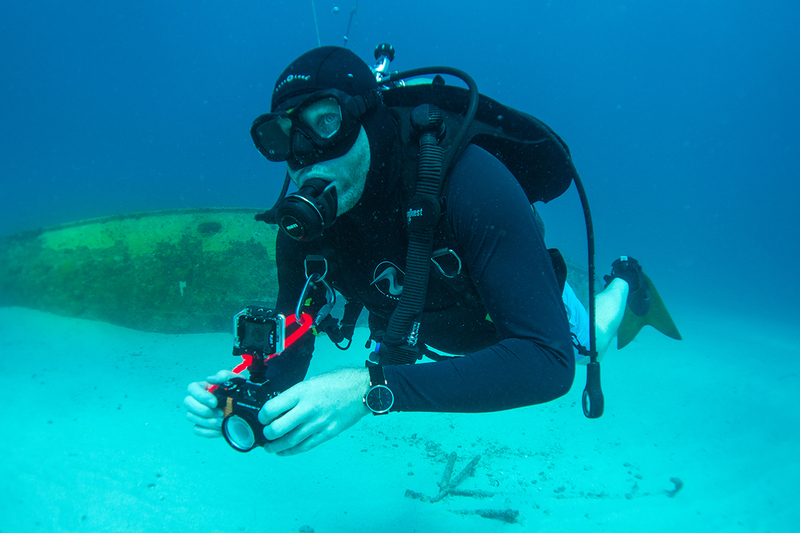 The only reason to really dive with the watch is so you don’t have to leave it on the boat. But the high contrast dial and hands were legible enough to read at 80 feet and its slim profile slipped readily in and out of dive gear where other bulkier watches have a tendency to snag. One advantage of drift diving is that the lack of exertion required means a tank of air can last a very long time. After close to an hour underwater, a glance at my dive computer told me that I was approaching my no-decompression limit. If I didn’t surface soon, I’d have to decompress on my way up, and I didn’t have enough air for that. I heard the dive boat rumbling reassuringly above and angled up towards it, pausing for a three-minute safety stop at 5m. With the day’s diving almost done, I now thought ahead to an afternoon of sipping mojitos at a shady beach bar, a decompression stop I, and the Nomos Ahoi, could easily handle.